So a couple of years ago, I had a Japanese 69 RI Mustang. The neck was too skinny and narrow, and my ape-like fingers could never properly do chords on it. Plus I just can't get on with the traditional 7.25" radius. So I got a second hand Warmoth neck with maple fretboard with a wider nut and a 9.5" radius. The neck was great, but the body was an ugly yellow-white, and with the maple neck it looked like the poo that milk fed babies make. 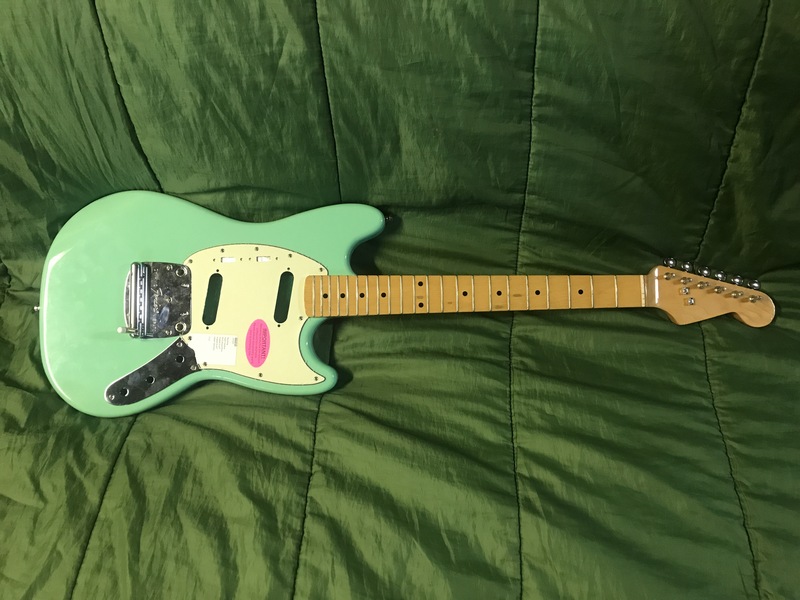 So I put the old neck back on and sold the guitar. I kept the Warmoth neck, vowing that I would one day put it to good use. I ordered two grey bottom "70's style" strat pickups from GuitarFetish and some chrome colored robroe style pickup covers from eBay, hopefully they'll arrive soon! I would like to do something non-traditional with the two 3-way switches. I never really cared for the out-of-phase option. Is there a way to wire one of the switches as a series/parallel switch? Anybody have any other suggestions for cool wiring mods I could do? This is how my mustang is wired. It basically uses the two swtiches to get the popular 4 way switch mod common to telecasters. Wow that looks cool! Thanks for the diagram. Looks like exactly what I need! Dang, that looks aaaaaace, proper 80s neon colours, laaarvely. Mr/Mrs Chemist, how do you find that switching? How do Mustang pickups sound parallel vs series? It's tempting, but I'd miss having the phase options too.. I wonder if it's possible to have both phase AND series-parallel options with the stock switches? Thanks! 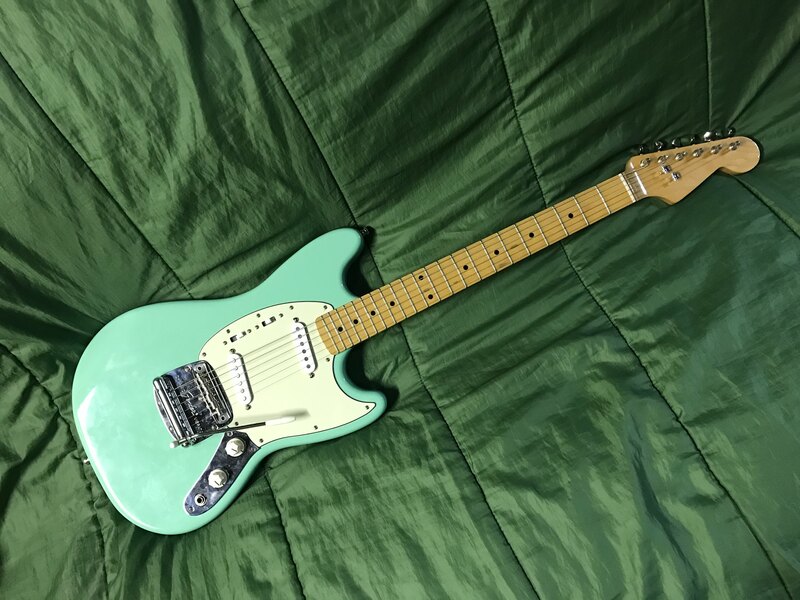 It's surf green but the shade on this body seems much more intense than the more pastel hue that Fender uses. 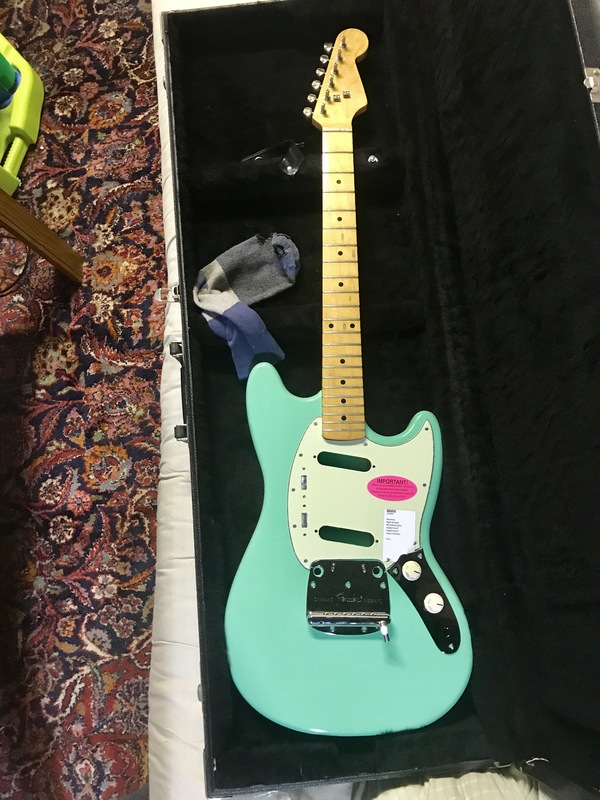 I don't know if the Warmoth version of surf green is always this bright or if it's an anomaly from when they mixed up this particular batch of paint. Today I drilled all the screw holes for the trem, pickguard and control plate. I also had to enlarge the bridge thimble holes with my drill because the thimbles I bought were a little wider than the holes by a millimeter or so. I also installed straplocks. Thankfully everything went well and I didn't mess up! I have a Staytrem bridge that I'll be putting on the guitar when I'm ready to string it up. Hopefully soon the pickups will arrive so I can start soldering. Here's a new pic, looks like the previous pic but now there are screws in the holes and no socks photobombing the picture. That looks grand. I wish I had funds cause there's a nice Sunburst hardtail one for sale on there atm. damn this looks nice but do you lose the out of phase option? Sheilded the cavities today. I used copper tape that has a conductive adhesive on the back, so I assume I don't have to do solder points between each strip of tape. When I hook up the ground wire from the tremolo, do I just solder the other end to the sheilding tape in the pickup cavity? I'm guessing it would be ok since the sheilding tape was done so that it comes in contact with the metal control plate. I know how to solder but I have zero understanding of electrical theory so sorry if it's a silly question! On the first question, you look to have done a gone job shielding, and if it is indeed conductive adhesive, I wouldn't worry about additional contact between tape. Soldering to shielding tape is difficult IMO, but not impossible. As an alternative, I would use a small circular crimp terminal on the end of the wire and screw it into the tape / body. More importantly, though, in case it's not obvious, you'll still want to ground the electronics as normal. Don't rely on the tape for ground...yeah it'll be grounded if done right, but it's mostly there for insulation. And avoid ground loops...ex. if one pot is connected to another via a capacitor that touches ground, don't add another ground between the two. That's potential grounds (hyuk hyuk) for amplifying any interference you might get. P.S. - Slightly jealous because if I were to build a Mustang it'd be that same color combo. Looking great. Oh and this is a pretty good read, even though it's talking about Strats. Thanks for the info and the link, Dillon! I will read the article later tonight, looks very informative. Would it be better if I solder the wire from the tremolo to where I ground the electronics instead of the copper tape? So tonight I wired up the guitar. I made sure to follow the above series/parallel diagram, going slowly, double checking to make sure I followed the diagram exactly. When I finished, I strung the guitar up and plugged it in. Well, there is a faint "click" that can be heard through the amp when I flip the pickup selector switch. I can make the clicking sound fainter or muted by adjusting the volume pot, so I'm guessing the pots are wired correctly. There is no click through the amp when I flip the series/parallel switch. Could that switch be where the problem is? I have wired up many guitars with no problems before. I am not sure how I should go about to trouble shoot this situation! HALP ME! On the bright side, the guitar plays smoothly and sounds loud and rich acoustically! With my (nonexistant) wiring experience I would probably connect the ground on the jack to the pot and ground those to the bridge (even though it says optional). Put some electrical tape in the bottom of the switch cavity. There's not a lot of clearance under the switches, especially with the wires attached and it's easy to send the signal to ground. Try lifting the guard a bit and see if that gives you sound. Thank you Thomas and dylanafghjkl, you guys figured it out! I took off the pickguard and connected it to an amp. Tapping the pickup pole pieces produced an audible click through the speaker. 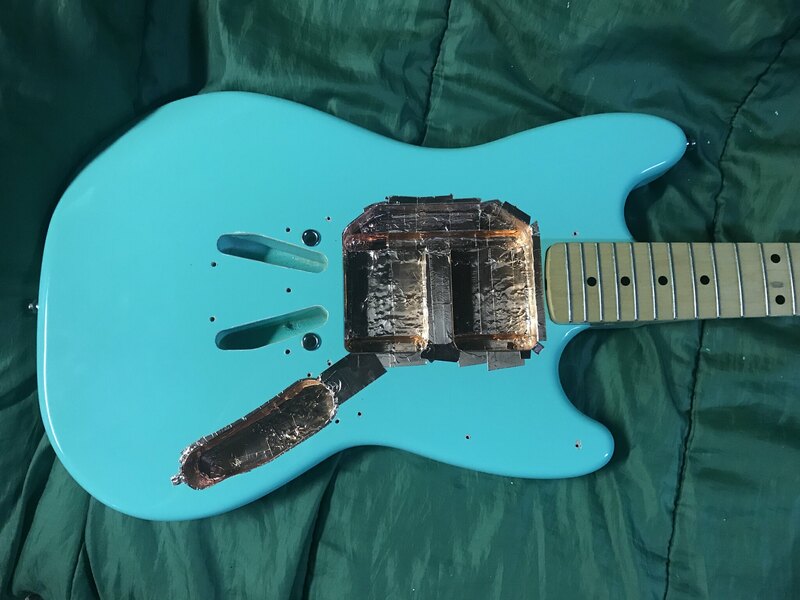 So I lined the switch channel route in the body with electrical tape over the copper shielding and put the guitar back together. Unfortunately for me it's past midnight and the kids are sleeping so I can't crank it up! Guitar is almost complete. I am awaiting some eBay purchased chrome robroe pickup covers in the mail, currently heading here on a slow boat from China so it might be another few months. I have two white Fender Japan robroes which I tried using, but they are mysteriously longer than a standard strat pickup by about 1 mm and they won't fit in the pickguard unless I enlarge the holes. Since I don't want to do that, I am using the standard strat covers that came with the pickups until I get the chrome robroes in the mail. I love that. Black solid covers would look best imo but this is cool. Also, guitars aren't supposed to work the first time you put them together.